People often use it to remind us that the work we choose is important, no matter what it is. I’ve often heard people refer to it in contexts where phrases like “speak your truth” and “dance like nobody’s watching” and “be your best self” come up. It seems as though the underpinnings of Gibran’s point touch on the fact that the way we work can be as important as what we do. Religions address this question, too: sometimes the language there talks about whether it is most important that adherents undertake “right action” or that they live with “right intent”. Maybe it’s that having God in your heart is the key; maybe it’s that by their fruits and by their works shall ye know them. In any case, people have been talking about the idea that your mindset and your approach matters for a pretty long time. I was out for a walk today in south Burlington, VT, where I’m taking a couple of days off from work to visit my partner, Jasmine. I had hoped that we’d have time to go for a walk today, because I checked her schedule before making a surprise visit—but it turns out that she’d made some work commitments that I hadn’t seen when I checked her calendar, and this afternoon’s walk wasn’t going to happen. Frustrating? Sure. I made a plan and put a bunch of effort into it, and it didn’t go the way I intended. But while I was out walking alone, I came across the Gibran quotation stenciled onto the back of a building, and it got me thinking. I think Gibran got it right, but that there’s something else of value to consider here. Switch those words around. 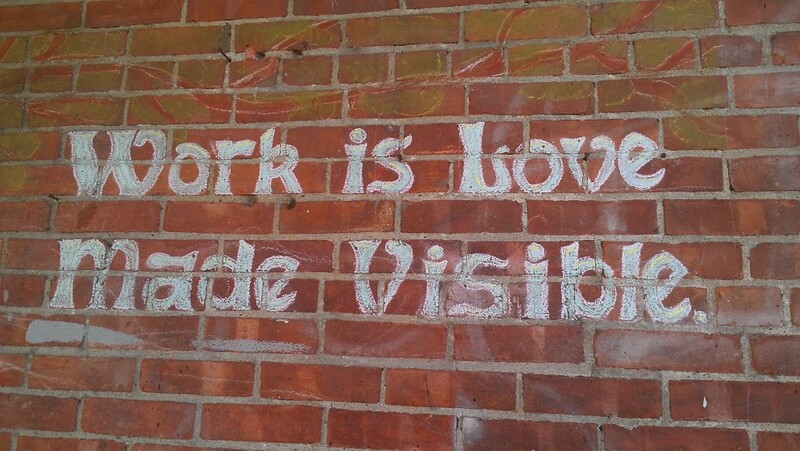 Love is work made visible. It’s even true, sometimes. There are moments in a loving relationship, whether romantic, filial, parental, or whatever, where everything is just easy, everything flows, the words tumble out, and smiles abound. But more often than not, love takes work. Sure, it’s not always work, and the work looks different for each person. But in thinking about it, every kind of loving relationship I know of requires work. Parents spend untold bazillions of hours working hard to care for their children, raising and feeding and sheltering and teaching them. We name the formal beginning of that process “labor”. Romantic relationships—if they last long enough—always make it through the honeymoon phase into the territory where people’s differences start showing up, and the relationships that last do so largely because people put enough effort into reconciling those issues so the underlying love can flourish. Even children work at loving: watch the way kids try hard to live up to their parents’ expectations, or the way two sisters find a way to make up and resolve their problems after a tearful spat. I think there’s still a place for unconditional love, but it’s my experience of living and watching other people that unconditional love doesn’t stretch as far as people think. Pretty soon, differences start showing up and people start working to accommodate them. We’re taught to believe that you can judge the quality of love by how little people have to work to sustain it: by how easy it is. We might all be happier if we took the measure of love by asking how much work people were willing to do to sustain it. Gibran also writes “if you grudge the crushing of the grapes, your grudge distils a poison in the wine“, and he’s right. So I’d like to see us shifting our cultural narrative away from the fairytale romance where everything is easy once you meet the right person toward the idea that it’ll take work to love people—and that we should encourage them to find ways to work more joyfully in that vineyard. Love is work. And that’s a good thing.